that we should be called the children of God! And that is what we are! The decibel level was high and the excitement level barely manageable. It was a hot, humid Texas Fourth of July. We were enjoying a family gathering complete with grown children, grandchildren of all ages and two very blessed grandparents. We had stuffed ourselves with hamburgers, hot dogs, baked beans and potato salad. It was finally time for the fireworks and what fun they were…beautiful, but definitely noisy. 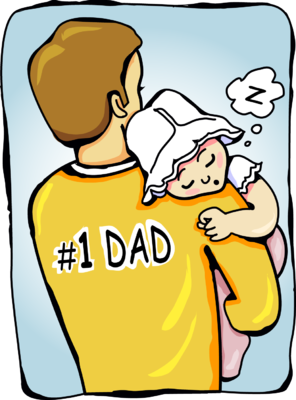 In a moment… and after more tears…she laid her head back down on her daddy’s chest and briefly closed her eyes. Her daddy continued to stroke her back and tell her that everything was going to be alright. She was still for a moment then raised her head again, put her hand on her daddy’s cheek again and began to babble away…seemingly telling her dad exactly how things were and that she was not happy. He continued to reassure her and tell her that everything was going to be alright and she would feel better after she had some rest. The scene was repeated three times and then finally she put her head down, closed her eyes and went sound asleep amid all the chaos…believing that like her daddy said, everything was going to be alright. As I watched sweet little Avery, I thought, “I know exactly how she feels.” I have often allowed myself to become so overwhelmed by the circumstances of my life that I felt I could no longer cope. I have known what it is like to have the noise of the world around me become so loud that it was frightening. I have known what it is like to be so tired that I couldn’t see the light at the end of the tunnel. The solution to my problems has been the same as Avery’s…allow my father, my Abba Father, to gather me into His arms, to tell Him about my struggles, my pain, my fears, to believe Him when He says everything will be alright and then to rest. Like Avery, we have a Father who loves us, is tender enough to hug us and strong enough to protect us and make things right. Truth to Claim: God is our Abba Father and it is okay to tell Him all about our struggles and then rest in Him confident that He is in control. Application: Learn all we can from scripture about the fatherly characteristics of our God. The women’s ministry at my church recently hosted a mother-daughter banquet. Our theme was Teapots and Teacups…Overflowing With Truths That Transform. In preparation for the banquet we discovered that there are actually a lot of parallels between tea and our spiritual lives. For example, brewing the perfect cup of tea takes time and patience. Let it steep too little and it is weak and tasteless. Let it steep too long and it is strong and bitter. Likewise, becoming the woman that God designed us to be takes time and patience as well. Even though we don’t like to wait it’s a part of life isn’t it? We wait in traffic, in car pool lines, in holding patterns on the runway, in grocery stores, for retirement, for sermons to get over, or even for Jesus to return. But we don’t like it do we? We have been conditioned to have it our way, right away. Our family knows about waiting. My son and his wife discovered that they were unable to have biological children so they decided to adopt internationally. God sent them two beautiful children by way of Russia… and believe me, they were worth the wait. After a time, my son and daughter-in-law felt one more child would make their family complete so they decided to pursue another international adoption. However, they discovered that Russia no longer permitted Americans to adopt…a door closed. They then decided to explore adopting a child from the Ukraine but, shortly thereafter Russia invaded the Ukraine… another door closed. So, they decided to pursue a domestic adoption. They filled out the required forms… and they waited. They attended parenting classes… and they waited. They had a home study…and they waited. They prepared their family album to be shown to perspective biological parents…and they waited. They waited until they had just about given up hope fearing they might be too old to adopt a baby if they were not chosen soon. And then the call came…they had been chosen…a baby girl had been born, she was healthy and beautiful and she was theirs. They brought her home when she was four days old. …and, there is no doubt in our minds that she was worth the wait. You know, waiting on God is a regular refrain in the life of faith. Matthew 7:7 says “Ask and it will be given to you; seek and you will find; knock and the door will be opened to you.” But asking, seeking or knocking often leads to a season of waiting. Some of us are in the waiting room today aren’t we? Waiting for an answer from the Dr. But, waiting is not just something we have to do to we get what we want. Waiting is the process of becoming what God wants us to be so that He can give us what we need. Whether it’s simply spare moments or seemingly endless days, waiting is no waste in God’s economy. Scripture is full of examples of people like us who had to wait on God. Generally we think of waiting as a passive activity but in reality it should be active. In the adoption process my son and daughter-in-law waited but they were also active…filling out forms, attending classes, preparing for a home study and preparing a family album. Believe that the God who saved us hears our cries. As Micah 7:7 says, “But as for me, I watch in hope for the Lord, I wait for God my Savior; my God will hear me”. Watch with expectancy, but be prepared for unexpected answers. As Psalm 5:3 says, “In the morning, Lord, you hear my voice; in the morning I lay my requests before you and wait expectantly”. Put our hope in God’s Word. We are tempted to put our hope in things that will disappoint us…things of the world. But, remember that according to 2 Peter 1:3 we have everything we need for life and godliness through our knowledge of him who called us by his own glory and goodness. Get on with our lives while we are in the waiting room…not put them on hold. Ephesians 5:15 says, “Be very careful, then, how you live – not as unwise but as wise, making the most of every opportunity, because the days are evil”. Be grateful for where we are today and for what God has brought us through. 1 Thessalonians 5:18 says, “In everything give thanks: for this is the will of God in Christ Jesus concerning you”. Recognize that God is in control, even when it seems He has forgotten us. Romans 8:28 says “All things work together for good to those who love God and are called according to His purpose”. So, while you are in the waiting room, remember God’s faithfulness. Truth to Claim: Waiting is not incidental to faith. It makes up the building blocks of a faithful God. Application: When you are in the waiting room, actively serve God until the answer comes. It is interesting that if you break down an average human body, the chemical composition has a worth of about four dollars and fifty cents in our world today. That includes everything – even your skin and bones. This is what your body is when you break it down. Dinner at your local fast food restaurant costs more than you – chemically speaking. If we are only worth $4.50, why do we invest so much in our looks, our education, our jobs, our hobbies…? Obviously, being human means more than just existing. We strive, we compete, we desire, we feel. We are composed of more than just chemicals…we are beings with a heart and soul. Genesis 1:27 says “So God created man in his own image…”. This value is only temporal. There is, however, a value that can never be replaced and will never fade away. This is the value that God places on us. He says we are worth an eternity with Him. This was brought home to me in the following responsive reading based on passages from Isaiah 53:1-8 and Matthew 20:19 and used by our church as a part of its Good Friday service. He has no form nor comeliness; and when we shall see Him, there is no beauty that we should desire Him. He is despised and rejected of men; a man of sorrows, and acquainted with grief; and we hid as it were our faces from Him; He was despised and we esteemed Him not. And yet, He loved us and thought that we were worth it. Surely He has borne our griefs, and carried our sorrows. Yet we did esteem Him stricken, smitten of God, and afflicted. But He was wounded for our transgressions. He was bruised for our iniquities. The chastisement of our peace was upon Him and with His stripes we are healed. All we like sheep have gone astray. We have turned every one to his own way, and the Lord has laid on Him the iniquity of us all. He was oppressed and He was afflicted, yet He did not open His mouth. He is brought as a lamb to the slaughter. For He was cut off out of the land of the living, for the transgressions of the people was He stricken. And yet, He loved us…and thought that we were worth it. And He promised that He would rise again. We are valued…worth more than His Kingship; worth more than His glory; worth more than His authority; worth more than His life in heaven…even more than a brutal death on Earth. Know your value. Don’t let the world tell you what you are worth. Truth to Claim: Our value is determined by God and He proved it by sending His Son to die on the cross for us. 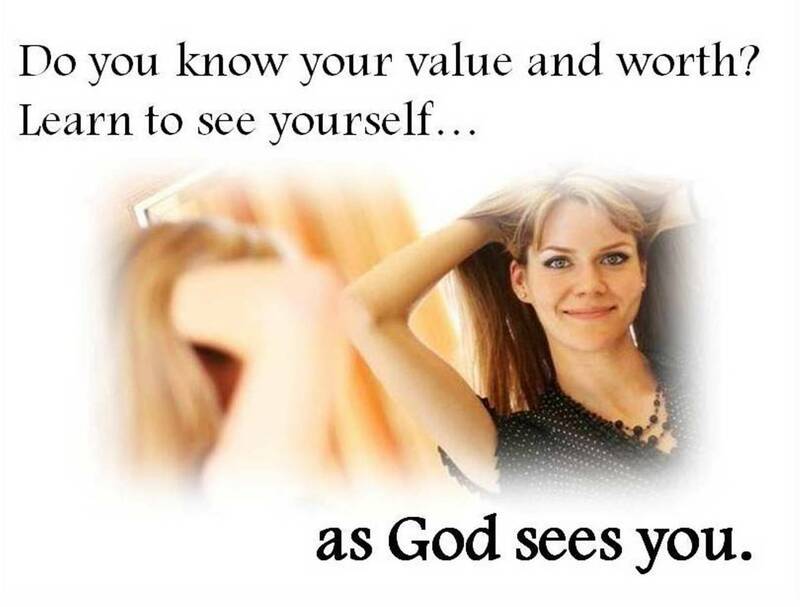 Application: When we are prone to think of ourselves as worthless, we will look to scripture to find our worth. They are everywhere…selfies that is. You will find them on various apps including Facebook, Instagram, and Snapchat. The world seems obsessed with taking them and posting them online. According to Samsung, a million selfies are taken every day and account for almost 33 percent of all photos taken in 2014 by people between the ages of 25 and 33. They are most common in Australia, followed by the U.S. and Canada. 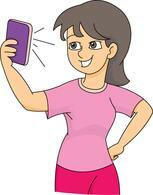 But what is the motivation behind selfies? Is it to show everyone what we look like at our best and how we spend our time? Sometimes it’s fun and OK, but if we are obsessed with selfies we may need to ask ourselves if we have self-esteem issues. Are we seeking attention, positive feedback or social validation from the outside. In other words, are our selfies an expression of pride and celebration of life or a call for affirmation? There is really only One who can affirm our worth…and that is Jesus Christ. if I was good enough…then I would be worthy of God’s love and acceptance! But you know what? I couldn’t measure up to God’s standard. It wasn’t for lack of trying! I gritted my teeth with determination. I summoned my strongest will-power. I made countless resolutions! But try as I might, I would fail again and again. One Spring night at in a revival service I had an “ah ha” moment that changed my life. The evangelist was talking about the love of God and the fact that while we were still in our sin God loved us so much that He sent his one and only Son to die for us and pay the penalty for our sin. Imagine, God loved me even when I wasn’t very lovable – even though I wasn’t perfect. That night I asked Jesus into my heart. Because of His love, He clothed me in a robe of righteousness, His righteousness – and now I am “good enough”. After Jesus came into my heart, I came to understand that it wasn’t all about me after all – but rather, it was all about Him! Now, when my Father looks at me, He sees perfection, because when He looks at me He sees His Son. Before I knew Jesus I was part of the selfie crowd because I thought it was all about me. Now that I know Jesus, I rejoice in the reality that it is all about Him! Truth to Claim: Our worth is found in Jesus because it’s all about Him? Application: Memorize some verses about how much God loves you so you can stand firm when Satan attacks your worth. It was a beautiful day! 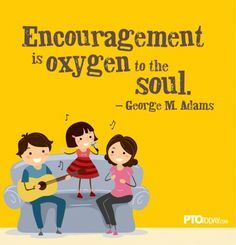 I had just finished my quiet time and was feeling so blessed…with a wonderful husband, awesome kids and grandkids, a comfortable home, great friends and a loving church family. Then it happened…I was surrounded. As I sat down to check recent Facebook posts, the attacks came at me from all directions…a Facebook post about someone’s new home, a story about a friend’s promotion, ads for things that I couldn’t live without, and a picture of a friend’s perfect family! The Great Distraction –discontentment – had struck again! If it’s old, we want something new. If it’s small, we want something bigger. If we have a hundred dollars, we want two hundred. If we have an apartment, we want a condo. If we have a house, we want a bigger house. Or a newer house. Or a nicer house. Or maybe we want to scale down and live in an apartment again. If we have a job, we dream of a better job, a bigger job, a closer job, a bigger office, a better boss. A certain amount of discontentment can be good for our souls. The hope of something better drives us forward and keeps us working, inventing, striving, creating and innovating. But there is another type of discontentment that propels us in the wrong direction. Identifying the causes of discontentment is one of the first steps in overcoming it. Unrealistic expectations – In our minds we have thoughts and ideas about how things should be, how people should behave, and how our life should be. These are just ideas…they are not truth. When there is a gap between our expectations and our reality, discontentment sets in. Comparing ourselves to others – When we compare ourselves to others we are comparing our inside to their outside. We may never know the issues another person is dealing with on the inside…all we see is their perfect outside. Attempting to live up to the expectations of others – Accepting others’ expectations or standards for our success never works out well. It leaves us feeling like no matter what we do it will never be good enough. In reality, discontentment is a spiritual problem. Discontentment exhibits a desire to be sovereign…or in control. Like Adam and Eve, (who lived in paradise and had it all) we desire to be like God and control our own destiny. God wants us to be victorious over our discontentment. So, let’s consider some steps we can take to become overcomers. Acknowledge that we are where we are by God’s assignment. 1 Corinthians 7:17 says, “Nevertheless, each one should retain the place in life that the Lord assigned to him and to which God has called him”. God has given each of us a job to do. He has gifted each of us in a certain way and has assigned us a particular place in life. The issue is not circumstances. We should serve God where we are until He clearly calls us elsewhere. Focus on Gratitude. 1 Thessalonians 5:18 says, “Give thanks in all circumstances; for this is God’s will for you in Christ Jesus”. Thankfulness is a state of mind, not an accumulation of assets. We will never achieve contentment until we are truly thankful for God’s provision…in all circumstances. Reject a fearful spirit. 2 Timothy 1:7 reminds us, “For God did not give us a spirit of fear, but of power and of love and of self-control”. One of the most effective tools used by Satan against Christians is the question, “What if?” Christians get trapped into hoarding because they fear the “What if?” of retirement, disability, unemployment, economic collapse, and so on. Remember that we are visitors on earth…not permanent residents. Hebrews 13:14 says, “For this world is not our permanent home; we are looking forward to a home yet to come “. We should not be preoccupied with things that don’t matter… trying to hang on to things of the world. Corrie Tin Boone said, “Don’t hold on too tightly to the things God has given you or it may hurt when He has to pry them out of your hands”. Contentment seems illusive to many of us. We feel as if we will never be able to find peace. However, contentment is not something that we must search for until we find it. Contentment is an attitude of the heart. 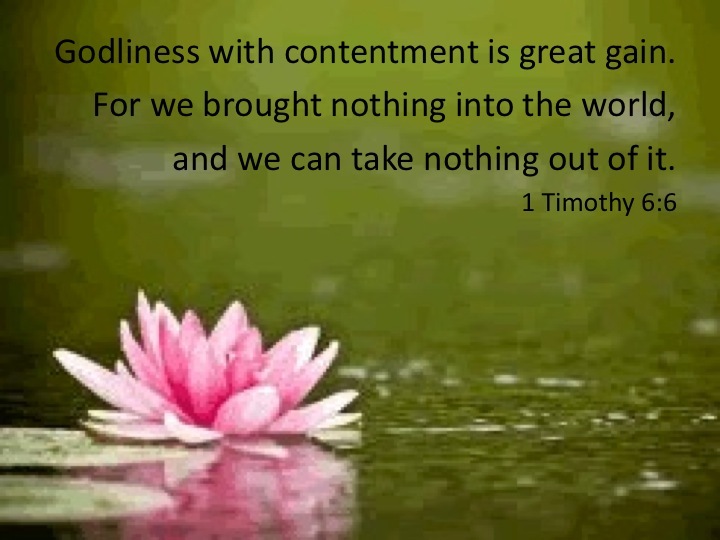 Once we alter our attitude and give it to God, contentment will flood our souls and we will no longer be distracted by the things of this world. Truth to Claim: God wants us to find contentment in Him. Practical Application: Ask God to show you those things that rob you of contentment and commit to giving them to Him. I rolled over and looked at the clock…6:45 am…another day. But, it wasn’t just any day. It was the first day of 2016. Would it be just another day…more of the same? Or, would it be different from the others that had preceded it? What is it that determines the outcome of our days? The impetus behind great art, or great music, a great sports team, a great drama, great architecture or a great sermon is passion. Passion drives scientists to find new cures for dreaded diseases. Passion equips athletes to break records and get to the Olympics. Passion is what sustains us when we feel like giving up. Without passion in our lives, our lives are dull, drab, boring. If God wired us to be passionate, why do we so often live without passion and purpose? Maybe it is because we fall prey to the passion killers of life. We have allowed something precious to become familiar. We have forgotten how it was before we knew Jesus? We have forgotten our value…the price Jesus paid to set us free? We fail to count it all joy when we are experiencing life’s trials and hardships…a joy not based on circumstances but relationship. We have an unclear purpose. A clear purpose creates passion as we begin to see our part in God’s plan. We live in a society that values political correctness and are afraid that our passion for God will offend others. We look to others for acceptance and approval instead of Jesus. We have an unbalanced schedule. When we are overworked we tend to lose our passion. We may even develop compassion fatigue and eventually just stop caring. We have unconfessed sin and the guilt that comes with it. It is impossible to have passion and guilt at the same time. We have an undernourished spirit…the greatest passion killer of all because it is the root of all the others. At its root passion is a spiritual issue…the heart of the matter. Passion is not restored with money, something physical, something material or a pill…it comes from the heart. If we don’t nourish our spirits our hearts will grow cold and hard. We could go on but you get the idea. So what are some steps that we can take to become passionate Christian women? We must make up our minds that we are going to regain our passion…there is power in a made up mind! We must confess that we have lost our passion. Going though religious motions can dull our spiritual senses and blind us to our own condition. But God can open our eyes! We must take action. God will do His part to increase our passion, but He also expects us to do our part. So what actions can we take to ignite our passion for God? We must hunger for truth. Refuse to accept mere human opinion or feeling-based experience. But, realize that we cannot be passionate about someone we do not know…what He has done for us and how He has revealed Himself through His Word. (Acts 17:11) We must memorize important passages of scripture and apply what we learned. We must live today with tomorrow in mind. As passionate Christian women we know our time is limited…that we will have no second chances. So, we should be compelled to live each day to its fullest…to follow hard on the heels of the very God in whom we live and move and have our being (Acts 17:28). Is this a description of the perfect Christian woman…no, but rather a passionate one. Passionate Christian women don’t have boundless amounts of energy, super-human strength, or superior spirituality. Rather, they are ordinary women who fail, fall and are tired at the end of the day. But, they have heard from God through His Word, seen the Holy Spirit work in their lives, and have experienced peace, answered prayer, and power and comfort through the Holy Spirit. Truth to Claim: God desires that we live lives that are passionate for Him. Personal Application: Make up your mind today to live a life passionate for God …may others say of you and I, “This girl is on fire!”.